"We not only make them work, we make them look great!" Is your barometer on the blink? If so, we can repair it for you! We bring sixty years of experience dealing in and repairing antique barometers. Our facilities are extensive and complete. We are able to repair woodwork, veneers, and inlay. The mechanisms of wheel barometers. Thermometers can be made to order to match an existing scale. Broken glass can be replaced and special tubes can be blown by our glassblower. Brass parts can be repaired and polished. Scales and register plates can be resilvered if necessary by the hand rubbed method used 200 years ago. 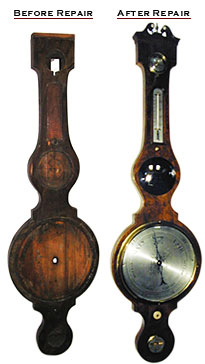 It is best to call before sending your barometer for repair as we can often give estimates over the phone. We have limited delivery. Call for information.